With so many food particles swirling around, your dishwasher is bound to pick up some unwanted scents over time. Follow this quick fix to clear the air and banish foul smells. Q: I’ve noticed an unpleasant odor coming from my dishwasher, and my usual dishwashing detergent clearly isn’t strong enough to tackle it. Any ideas for freshening things up a smelly dishwasher? A: It’s certainly ironic to think about such a clean appliance smelling so foul, since the appliance’s job is to wash and sanitize dishes. But in reality, even top-of-the-line machines can fall victim to stray food particles. Over time, these tiny pieces get trapped in your dishwasher’s filter, and the buildup can create a faint odor that grows more offensive by the day. Thankfully, homeowners can easily fix a smelly dishwasher with a few simple steps and good old-fashioned vinegar. Remove all dishes and utensils, then use a damp microfiber cloth to clear out any debris on the floor and sides of the dishwasher’s interior. You may want to remove the bottom rack for easier access. STEP 2: Let vinegar work its magic. STEP 3: Add a fresh scent. 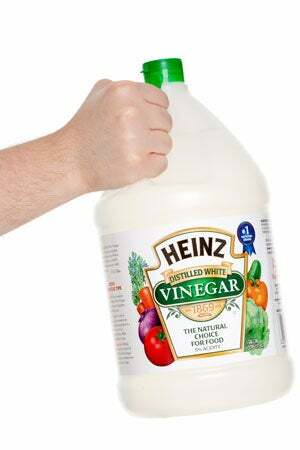 Despite its indisputable cleaning properties, not everyone is crazy about white vinegar’s scent. If you’d like to mask it with something more pleasant, add a few drops of an essential oil to the vinegar. Lavender, orange, lemon, or peppermint oils will create a crisp and welcoming aroma in your kitchen. Plus, the non-toxic essential oils have antibacterial properties to boot! STEP 4: Repeat the process four times per year. To avoid a whiff of a smelly dishwasher in the future, repeat the vinegar cleanse once every few months, or whenever it’s needed. Now you’ll always breathe easy in your kitchen—no matter how often you run the dishwasher. Always take safety precautions. 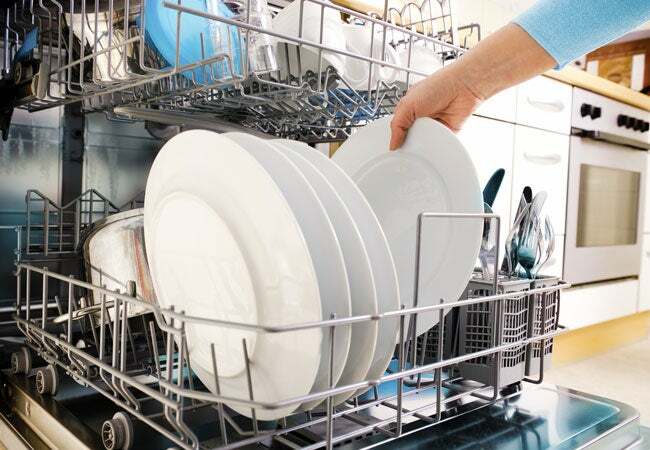 When cleaning your smelly dishwasher, never mix vinegar with chlorine—this can create toxic fumes. While you may not intentionally use the two at once, they could accidentally interact if there’s still some liquid dishwashing detergent left over in the tray from a recent cycle. Best practice: Read your detergent label to see if the solution contains chlorine. If so, make sure there’s no potential for disaster by wiping out the detergent tray with a damp paper towel before you start the machine.